The job interview scenario has changed greatly over the years. The modern firms have broken the conventional norms and are trying to be unique in their ways. Many of the modern startups arrange their interview rounds in truly unique ambience that is quite difficult to imagine. Just because it is a casual setting, do not take the dinner interview lightly. You need to follow all the etiquettes that are usually followed during a formal interview session. Remember that the first thing that creates an impression even before you open your mouth is your appearance. So you need to make sure you are perfectly well dressed for a dinner job interview. It is always best to choose plain formal shirts while heading for any job interview. A dark shade of shirt would be better for such interviews as the food stains would be less visible on darker shirts. Pick a colour that suits you and makes you appear confident. While dinner interviews are often held for people at higher positions, the casual ambience is just a shield. The interviewers are observing you just as they would in any other job interview. So you need to take extra care not to annoy them. You may revise the table manners once before heading for a dinner job interview. The company may want you to be the face of their brand. They may expect you to meet foreign clients at similar casual settings. They are trying to assess your table manners in such situations. So make sure you know in which hand to hold the fork and knife. You must also know how to use the napkins and the tissues during mealtime. You may check online videos that will guide you on significant table manners. You could be nervous because of the unusual setting of the job interview but this should not affect your performance. You must be courteous when you interact with your interviewers. Shake hands and welcome them with kind words. Wait for the interviewers to take their seat before you sit down. Try to maintain a good demeanour as this counts a lot when you are appearing for a senior level job interview. You also need to have a good control over your body language. They are going to observe these little facts too during the interview session. Chivalry maybe long dead. The changing times and the winds of gender equality may have erased such manners of the past. Yet, there is no harm in being chivalrous if you have a female boss who is interviewing you. Letting her have the seat first or being kind to her would do you know harm. You cannot read the mind of your interviewers but being polite and kind towards them is always going to help. The way you speak, your tone and your body language are all known to have a great impact on the interviewer. So you need to be careful while speaking. You need to maintain an erect posture as this reflects confidence. Similarly avoid body language that clearly reflects nervousness. Do not scratch your head, look shaky or fumble while appearing for the interview. These are huge turnoffs and they can actually make the interviewer choose against you. One of the greatest challenges you are posed with during a dinner interview is how to deal with the new casual ambience. The simple answer to this question is to stay alert and act to suit the new environment. Since you know it well that the interviewers are going to observe you, you must be careful with your food choices. There are two aspects to this. First is the economic aspect. When you are told to choose the food from the menu, do not pick the cheapest food available on the menu. Similarly, avoid ordering something that is very expensive. The second aspect is your own body language. You should choose foods that are not to be eaten by hand. It is always best to avoid Pizzas or Sandwiches in such situations. This is because eating with the hand may make you appear messy and this is not desirable during a job interview. There are chances that the interviewers offer you the drinks menu where alcohol is also listed. Yet, you must politely choose some non-alcoholic beverage to be on a safer side. This prevents creating any negative impression which you surely do not want at this point. Some people have the habit of smoking when they are nervous. That is the reason why you often encounter people smoking just before a job interview. Smoking is a bad habit and it is best to avoid this habit completely. It is not good if the interviewers see you smoking prior to the interview or after the interview. Doing it would completely spoil your chances of getting the job. You must not forget that the owners or the seniors have invited you for a dinner job interview. So you should not offer to pay the bill as it may create an odd situation. You must offer to pay the bill only if you requested for a dinner job interview. If that is the case, never expect them to pay. As already mentioned before, you need to avoid all the body language that may create a negative impact. During the dinner job interview, you may be inclined to keep your elbows on the table or lean onto the table. Avoid this urge completely. Leaning onto the table usually reflects lack of confidence. This can create an extremely negative impression on the interviewers. Maintain an erect posture so that the interviewers never tend to suspect your confidence level. During a dinner interview, you may be posed with a question anytime. You need to be mentally and physically prepared for the same. Taking huge bites can mean taking more time to chew and swallow what you have eaten. This means that if the interviewers have asked a question, they will have to wait a longtime before they get their answer. In order to avoid this, take small bites that you can chew and swallow in lesser time. This way, the interview process will happen smoothly without much interruptions. You must also keep in mind never to answer to questions when you have food in your mouth. This not just looks lousy but also creates a negative impression instantly. As a part of table manners, men should carry a kerchief when they are appearing for a dinner job interview. A napkin or a kerchief can help them stay neat and hygienic during the interview process. You may carry the napkin in your shoulder pocket or any other pocket where it is accessible. Avoid placing it in some difficult location where you may have to spend a lot of time to get it out. 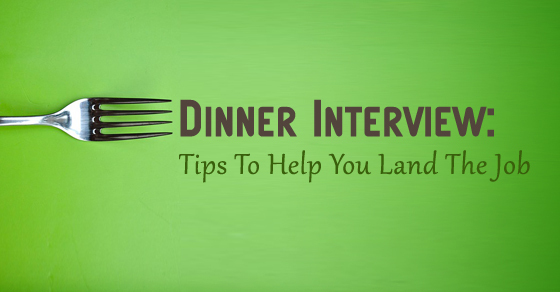 A dinner interview is just as important as any other job interview. You need to make sure you carry the latest copy of your resume for the interview. If you are an experienced candidate, you must carry a resume that speaks about your career achievements, reveals you career growth clearly and has all other details regarding qualifications mentioned in a glimpse. If you think that some notes need to be taken during the interview, carry a notepad along with you. Your interviewers will surely appreciate your professional outlook. This is definitely a logical tip that most people are aware of even without telling them. You should not parcel food leftovers in a dinner job interview. Since your interviewers are paying for the dinner, it basically belongs to them and you do not have the right to parcel anything. You can dine right there but not take anything home. Dinner interviews are often scheduled for higher level positions. The main purpose of such interviews is to assess you in your social and interpersonal skills too. There are some things that never become evident in a formal life. These include factors like manners, hygiene and basic etiquettes. These become evident only when you are put in such a situation. That is the whole idea behind arranging such lunch and dinner interviews in thoroughly informal settings. Understand these facts and you will be better prepared next time for such an interview.